Gravel over an existing base? I have an existing concrete/tarmac base that is looking tatty and I want to cover it with gravel - is this a good idea? There's a couple of problems in covering any existing hard surface, whether it's concrete, bitmac or anything else, with a loose surface dressing such as gravel. The most important of these is safety, but there's also an aesthetic problem. Whenever a small, loose, rounded or sub-rounded gravel is placed on top of a hard surface, we get what we call the "Ball Bearing Effect" - the individual stones that make up the gravel act just as would ball bearings or marbles on the kitchen floor: they move; they shift when a load is imposed upon them; they travel; and they usually end up sending someone to the local A&E Department. Obviously, some gravels are worse than others. Rounded and sub-rounded particles of 6-25mm are the most dangerous. Smaller gravels (which are better thought of as "grits") do bind together more effectively, but this should not be thought of as rendering them 'safe'. Larger pebbles are less likely to 'roll', but are uncomfortable to walk upon and need a greater depth to achieve effective cover of the underlying base. Angular material is also less likely to 'roll', but again, this is no guarantee that they won't roll. Flat materials, such as slate mulch and paddlestones are safer, but while there is a reduced chance of these coverings resulting in a visit to Casualty, they are still less than ideal and not something we would normally recommend. A sub-angular gravel isn't quite as bad, but is still bad enough! The second problem is less serious, from a personal safety point-of-view, but is an important consideration: the covering material is more or less guaranteed to be "scuffed off" the underlying base and so expose the hard surface beneath, giving the impression of bald spots. There is nothing to bind these loose materials. 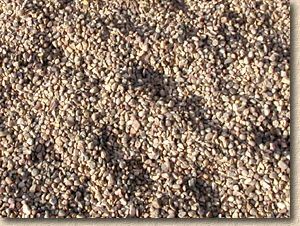 When they are placed over a granular sub-base, as shown on the Gravels Construction page, the gravels can 'bed-in' to the sub-base surface, and so become lightly bound and unlikely to roll or move. On a hard surface, there is no opportunity to 'bed in' - the material just sits on top of the surface. Any trafficking, whether it's just someone walking across or a car being driven over the gravel, exerts 'shearing forces' that want to push the gravel sideways, away from the imposed load, and it is these forces that result in the base becoming exposed. Often, the response to scuffing is to increase the depth of covering, in the vain hope that this will allow some movement/scuffing of the gravel at the surface while leaving the buried gravel undisturbed. Nice theory, but it doesn't work! The increased depth makes trafficking the gravel almost impossible - pedestrians and vehicles alike simply sink into the loose material and we're back to square one - a minimal covering over a hard base. So: in summary - gravels over an existing base? Well, we have a basic tenet of pavement construction that you may have read elsewhere on this website - Flexible surfacings on flexible sub-layers and rigid surfacings on rigid sub-layers, or, as we paraphrase it. "Rigid on rigid: Flexi on flexi". Putting gravel over a hard base is the equivalent of using a flexible surfacing on a rigid base. Don't do it! What about if I sprinkle sand over the gravel: won't that help it 'bind'? 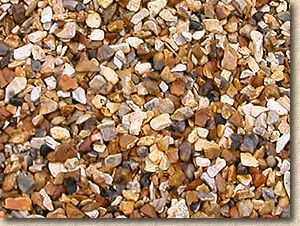 Think about it: loose sand mixed with loose gravel - how does that help stop the gravel from moving? In effect, all that you're doing is adding more loose material, albeit on a much smaller scale. There's still no interlock, no 'glue', no anything to stabilise the surface, so the short answer is NO! Adding sand will do nothing to improve the situation. 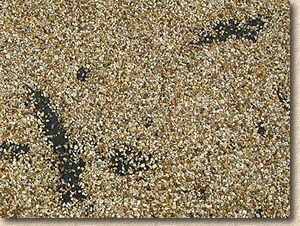 Tarmacadam - the ultimate version of bitumen bound gravels! Start again - sometimes, it's the only option!